The International Space Station's outgoing Expedition 11 crew and the new Expedition 12 crew gather inside the Destiny laboratory module for a change of a command ceremony, complete with ringing of the outpost's bell, as the human presence in space continues. The Expedition 11 mission of commander Sergei Krikalev and flight engineer John Phillips aboard the International Space Station is winding down, and this narrated retrospective looks back at the key events of the half-year voyage in orbit. NASA astronauts Bill McArthur and John Phillips chat with Associated Press space reporter Marcia Dunn about life aboard the International Space Station in this live space-to-Earth interview from the Destiny laboratory module on October 5. In preparation for the West Coast launch of Boeing's next-generation Delta 4 rocket, the two-stage vehicle is rolled out of its horizontal hangar and driven to the Space Launch Complex-6 pad for erection. The nose cone for the NRO payload is then brought to the pad. Boeing's Delta 4 rocket pad at Vandenberg Air Force Base was renovated in recent years, transforming Space Launch Complex-6 from the West Coast space shuttle launch site into a facility for the next-generation unmanned booster. This collection of footage shows the 1985 launch pad test using NASA's orbiter Enterprise. A Russian Soyuz spacecraft safely launched from Baikonur Cosmodrome Friday night with the International Space Station's twelfth resident crew and a paying tourist aboard. A team of NASA exobiology researchers revealed this week organic chemicals that play a crucial role in the chemistry of life are common in space. 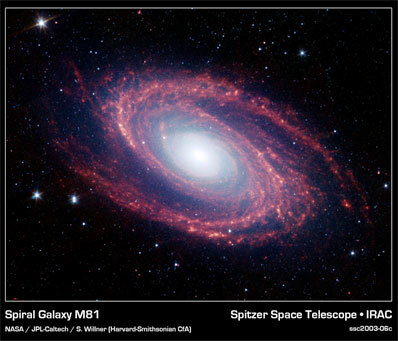 NASA Spitzer Space Telescope image of the spiral galaxy M81, located some 12 million light years from Earth. The infrared radiation emitted by polycyclic nitrogen-containing aromatic hydrocarbon (PANH) molecules is shown in red. This emission is excited by star (and planet) formation along the edges of the spiral arms. "Our work shows a class of compounds that is critical to biochemistry is prevalent throughout the universe," said Douglas Hudgins, an astronomer at NASA Ames Research Center, located in California's Silicon Valley. He is principal author of a study detailing the team's findings that appears in the Oct. 10 issue of the Astrophysical Journal. "NASA's Spitzer Space Telescope has shown complex organic molecules called polycyclic aromatic hydrocarbons (PAHs) are found in every nook and cranny of our galaxy. While this is important to astronomers, it has been of little interest to astrobiologists, scientists who search for life beyond Earth. Normal PAHs aren't really important to biology," Hudgins said. "However, our work shows the lion's share of the PAHs in space also carry nitrogen in their structures. That changes everything." "Much of the chemistry of life, including DNA, requires organic molecules that contain nitrogen," said team member Louis Allamandola, an astrochemist at NASA Ames. "Chlorophyll, the substance that enables photosynthesis in plants, is a good example of this class of compounds, called polycyclic aromatic nitrogen heterocycles, or PANHs. Ironically, PANHs are formed in abundance around dying stars. So even in death, the seeds of life are sewn," Allamandola said. The NASA Ames team studied the infrared "fingerprint" of PANHs in laboratory experiments and with computer simulations to learn more about infrared radiation that astronomers have detected coming from space. They used data from the European Space Agency's Infrared Space Observatory satellite.